Given our modern pace of life and sedentary lifestyle, muscle pain specified lower back pain and neck tension has become far too common. Whether it is shoulder tension from being hunched at a desk for hours, or wrist pain from typing at a computer, sore muscles can make any movement hard and painful. For a result, we rely on painkillers and creams to help dull the pain; however, these is simply a Band-Aid solution. Instead of reacting to muscle pain, we should be preventing it in the first place. A simple place to begin, is with a basic stretching routine. This stretches were chosen by Marilyn Moffat, a professor of physical therapy of New York University. Before starting, it is important to remember that if you feel any discomfort or pain while performing a stretch to stop and see a doctor or physical therapist. You’ll be holding each of this stretches for 30 to 60 seconds. The first step is to be sure you get seated with proper posture. Sit, with your chin tucked down and back so that your neck is aligned with your spine. Now you are ready to start. Slowly turn your head to the right and hold for 30 to 60 seconds. Face forward then repeat with the left. Cross your arms over your chest, and look over your shoulder, rotating at your trunk. Hold, and then face the front and repeat with the other side. It is very important to have a strong core in your body. This exercise is perfect for building strong abdominal muscles, in particular, the obliques which support the spine and lower back. 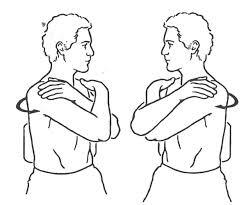 Bend to the side with the opposite side’s hand diagonally above your head, hold, then repeat with the other side. For these stretch, you just need a slight bend. It is just enough to stretch out your spine without going too far. 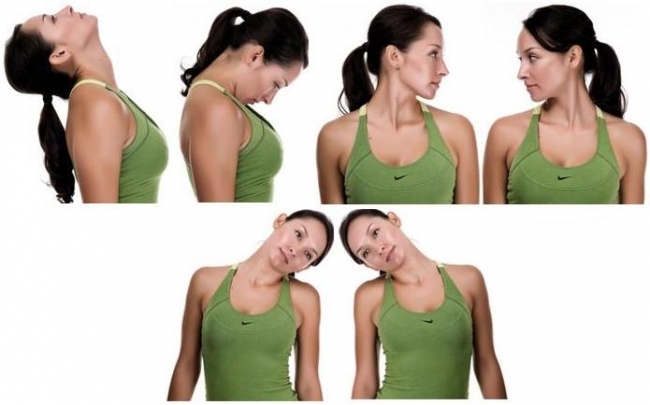 Tilt your head to the right and drape your right arm over your head, near your left ear. Do not pull, but let the weight of your arm help stretch your neck. Hold, then repeat with the other side. Bend over in your chair, making sure your neck is in the proper position and there’s no pain.Bend over in your chair, making sure your neck is in the proper position and there’s no pain. For these stretch, make sure that the top palm is facing the body and the bottom palm is facing out. Without hunching over, try reaching your hands together behind your back. Hold, then switch sides and repeat. Stand up straight, and grabbing the top of your foot, bend your knee so it is pointing straight down at the floor. Hold, then repeat with the other leg. Using a workout band or towel can help your really get a good stretch here. Planting one foot on the floor, bring the other leg up as high as you can, ideally at a 90° angle. You can put the band or towel around the foot you’re lifting to help get it higher. Hold and repeat with other side. You should feel your back leg muscles stretch, especially along your calf. Keeping your toe on the wall, and both feet planted, Bend your front knee toward the wall. Hold, then repeat with the other leg. Keep your neck and back down, fold your right ankle over the left thigh right above the knee. Hold, and then switch legs. If this is too intense, bring the uncrossed leg out farther. You will need to grab a mat or lay on a soft surface for these stretch. With one leg straight, bring the opposite knee to your chest. Hold, then switch legs. This is 12 stretches you can do daily to keep your muscles loose and working, and preventing muscle pain as much as possible.